Pie! 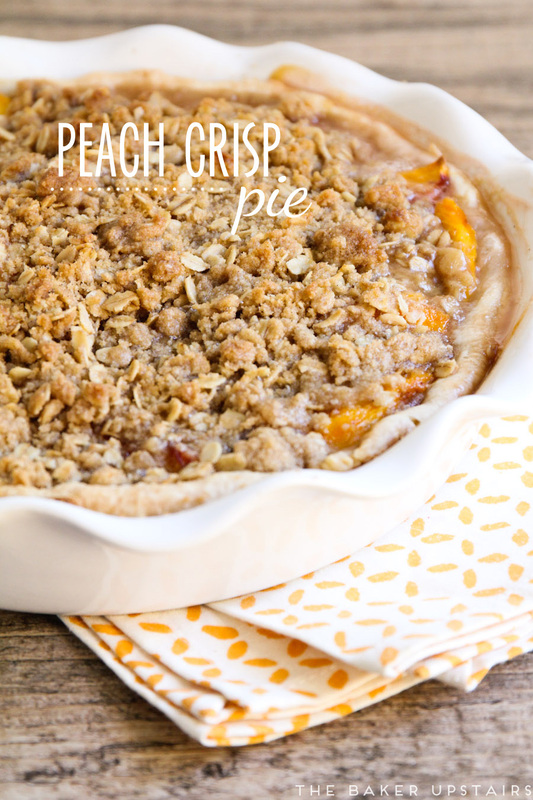 And not just pie, but peach crisp pie! Pie is one of my favorite desserts, but I've only successfully made a few pies during my lifetime. Like, maybe three in all of my thirty two years. I feel like I totally have a mental block when it comes to pie and I have convinced myself that it's just impossible. Anyway, a few months ago when we took our family trip to Portland, we drove out to Mount Hood and stopped for lunch at the cutest little barbecue restaurant called Apple Valley BBQ. I ordered a pulled pork sandwich (to die for!) and it came with the most delicious pear coleslaw. For dessert, we ordered a piece of peach crisp pie to share as a family, and it was the most heavenly piece of pie I've ever eaten. 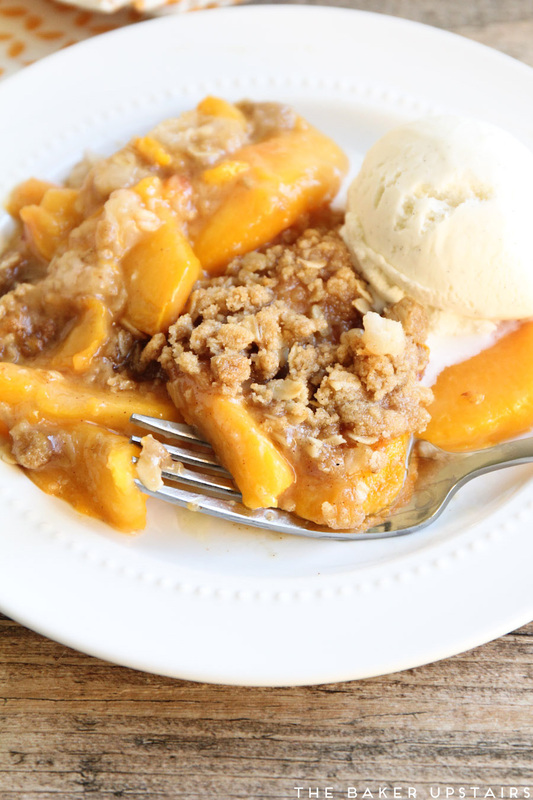 It reminded me of the peach crisp my mom used to make when I was a kid, but even better because it came in a delicious piece of pie crust. 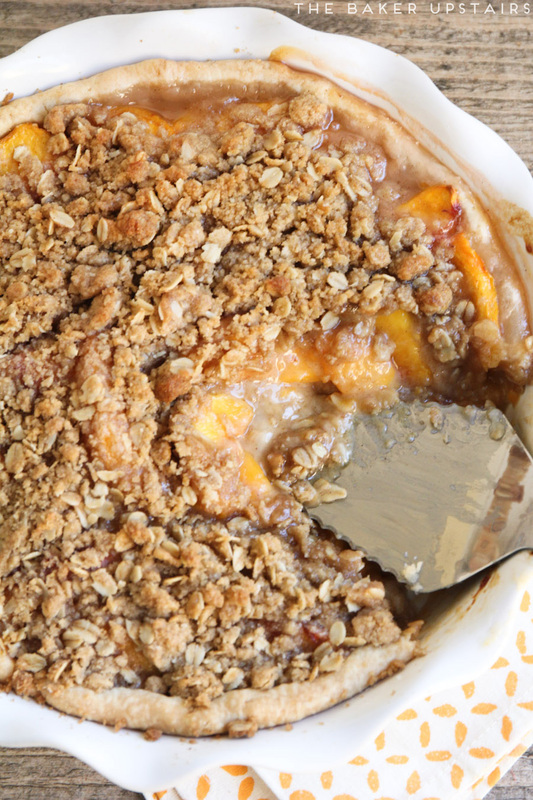 This peach crisp pie is my loving homage to that delicious piece of pie that I will remember all my life. (No seriously, I loved it that much.) I used a store-bought pie crust because I'm too afraid to attempt a homemade crust, but it was still fantastic. I used fresh peaches from my mother in law's trees for the filling, and topped it with a buttery, cinnamony, crunchy crisp topping. The pie turned out incredibly delicious! I'm still not sure it lives up to the Apple Valley BBQ pie (perhaps if I can master the homemade crust?) but it was a good substitute for this girl who lives 700+ miles away from the pie of her dreams. I should add that I was too eager to eat the pie to let it cool, and I cut into it while it was still steaming hot, thus the total hot mess all over the plate. (It was still delicious, of course.) 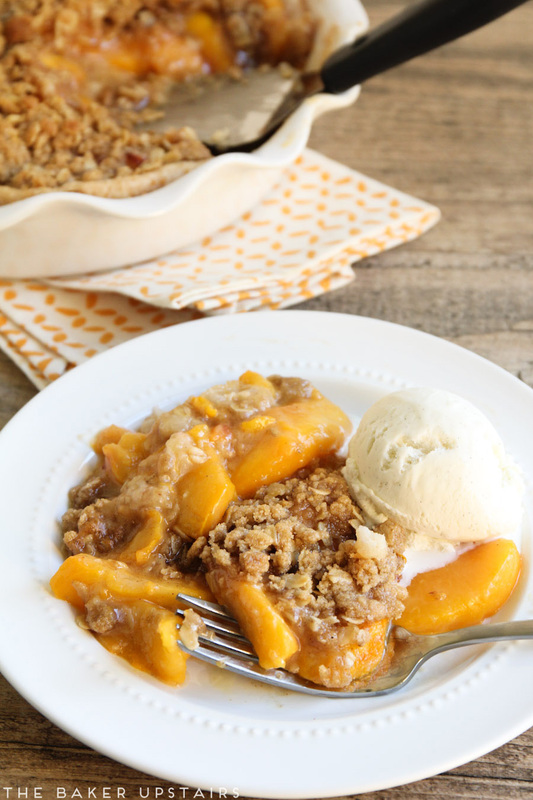 If you want your pie to look more like a pie, and less like a random pile of peaches and crisp topping, let it cool before you slice into it. I totally understand if you don't, though, because it's hard to exercise will power with something that tasty waiting in front of you. Preheat the oven to 350. Press the pie crust into a pie dish, shaping it as you please. In a medium bowl, toss the peaches with the lemon juice, sugar, and 2 tablespoons flour, and pour the mixture into the pie crust. To make the topping, whisk together the flour, oats, salt, cinnamon, and brown sugar. Cut in the butter using a pastry blender or two knives, until the mixture clumps together. Sprinkle the crisp topping over the peaches. Bake 35-45 minutes, or until the topping is golden and crisp, and the peach juice is bubbling around the edges. Remove and let cool before serving.